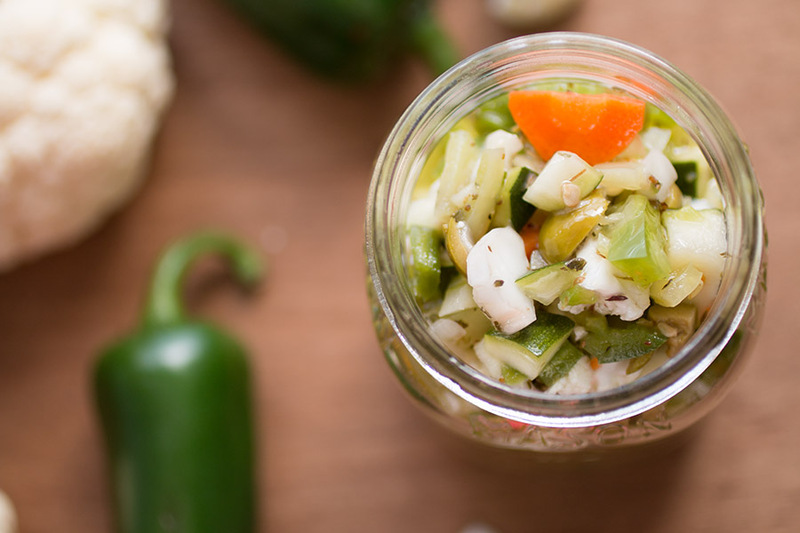 Giardiniera is a wonder condiment, turning any sandwich into a burst of flavor. Here is our Chicago-style giardiniera recipe with plenty of chili peppers, vegetables and seasonings. Giardiniera is something we encounter on a regular basis. Patty and I are from the Chicago area, and Chicago is well-known for its selection of beef sandwiches. If you’re from Chicago or anywhere near there, you can’t order a beef sandwich without giardiniera. It’s a travesty. If you want funny looks shot your way, go ahead and order one and tell them to hold the giardiniera. Okay, I’m half-joking, but only half. Seriously, giardiniera is a tasty condiment you can enjoy on any number of sandwiches, and not only at the ubiquitous beef joints. I personally love it piled onto a hot dog over over a crispy toasted sub sandwich. We have a chain sandwich shop nearby and we enjoy their flatbread sandwiches. They have a good giardiniera that I almost always order. Another small place nearby, though, makes their own homemade version that is outstanding. There is something about fresh homemade giardiniera that gets the taste buds jumping. This is my particular version. Add your chopped peppers, zucchini, carrot, celery, onion and cauliflower to a large bowl. Sprinkle the mixture with salt. Cover the whole thing with water and refrigerate for 12 hours, covered. In a separate bowl, add garlic, oregano, celery seed and ground pepper to taste. Add water and oil and whisk to combine. Add in the chopped olives and mix well. Place it all into jars, ensuring the vegetables are covered with your oil mixture. You an add extra olive oil if needed to cover the mixture. I make it at home frequently, though you typically need to make a larger batch, so plan accordingly. 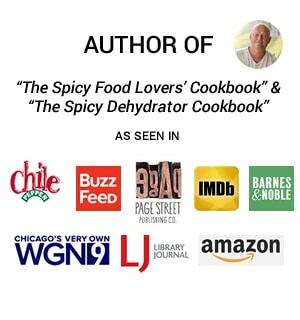 I call for jalapeno peppers in this recipe, as well as bell peppers, though serrano chili peppers are a very welcomed addition if you’re looking for a bit more heat and bite. Sport peppers are the traditional chili pepper that make Chicago-style giardiniera “hot”. You can skip the hot peppers for the popular “mild” version. 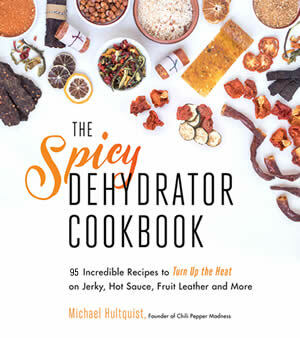 And if you REALLY want to kick this up a notch, go for the habanero pepper, or be like Mike and add in some superhots. 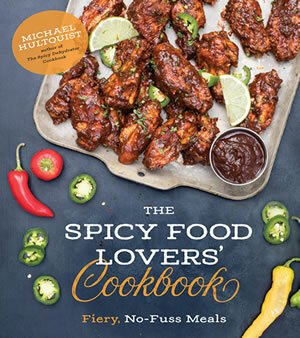 I am still working on my Superhot Chili Pepper cookbook and have a superhot version of this recipe included. Yeah, baby. Bring on the heat! This is certainly Chicago style, though, and won’t blow your taste buds with heat. You’ll get a nice kick and plenty of flavor. Enjoy! It is amazing how versatile giardiniera can be. You don’t only have to use it for sandwiches, especially a good beef sandwich. We made some flatbread pizzas with it, and even tossed it over grilled salmon. Think of it as a vegetable sauce. Think outside the box! 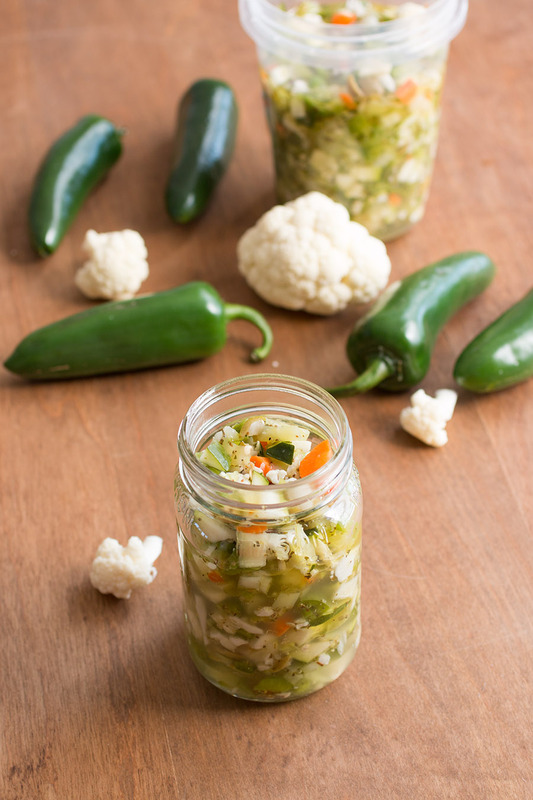 Giardiniera is a wonder condiment, turning any sandwich into a burst of flavor. Here is our Chicago-style recipe with plenty of chili peppers, vegetables and seasonings. To a large bowl, add all of the peppers with zucchini, carrot, celery, onion and cauliflower. Sprinkle with salt. Cover with water and refrigerate for 12 hours, covered. Add chopped olives and mix well. Place it all into jars, ensuring the vegetables are covered with your oil mixture. This is the second year I’m making this recipe. I made a big batch last year to use up peppers from my garden. I grew up in Chicago and relocated to Texas, and while they love their hot sauce down here, there’s nothing quite like Giardiniera! 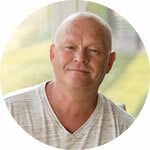 I made a quadruple recipe this year to give some away. I diverged from the recipe a little bit-After I packed in the veggies, I filled each jar half way with vinegar and topped off with olive oil, because I’ve always liked some more tangy flavor to giardiniera. Awesome, Katie! I like the vinegar with my giardiniera as well. Thanks!!! Nothing like a taste of home. Accidentally left the brine for a day and a half. Big batch too… problem? Will it just be too salty (maybe) or not safe? REPLY: Rich, I’m sure it’s fine. — Mike from Chili Pepper Madness. Can I add fresh mushrooms to this in place of zucchini? REPLY: Colleen, you can use mushrooms, though the consistency will change. Mushrooms get a bit mushy. I would cut them small. — Mike from Chili Pepper Madness. I’m going to make this tomorrow. Prepping everything now. Do you de-seed the jalapeno? REPLY: Kim, you don’t need to de-seed them, but you can if you’d like. — Mike from Chili Pepper Madness. Do I hot bath this and for how long and how hot? Thinking about doing pints or half pints for gifts! What would the proper times be for water baths? REPLY: You should process them for 10 minutes with proper water bath techniques. — Mike from Chili Pepper Madness. Rachelle, yes, you can can giardiniera. Just be sure to follow proper canning procedures and ratios. This is delicious. I added a tiny bit of habanera and pepperoncini’s, and omitted the zucchini and onions. Is this safe to can? This sounds wonderful and we have pretty much most of the ingredients growing in our garden, will book mark this for later! Try it on scrambled eggs and to kick up any tomato based italian dish. The stuff is magic. Why would you ask them to hold giardiniera? I love pickled vegetables…we live in China and pickles are a staple around here. Of course, they make them differently, but I always have pickled something in the fridge;) I’d love to try these! This is totally up my alley!! I’I think I have had something similar with big chunks of veggies as an appetizer at a local restaurant and was planning to try to make my own this summer. I’ll try yours too…it looks like it will be fabulous on sandwiches!